Copyright Michael Karbo and ELI Aps., Denmark, Europe. This development was actually described many years ago, in what we call Moores Law. Right back in 1965, Gordon Moore predicted (in the Electronics journal), that the number of transistors in processors (and hence their speed) would be able to be doubled every 18 months. Moore expected that this regularity would at least apply up until 1975. 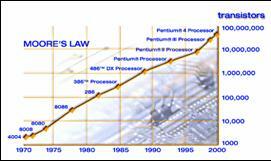 But he was too cautious; we can see that the development continues to follow Moores Law today, as is shown in Fig. 59. Fig. 58. In 1968, Gordon Moore helped found Intel. If we try to look ahead in time, we can work out that in 2010 we should have processors containing 3 billion transistors. And with what clock frequencies? You’ll have to guess that for yourself. Fig. 59. Moores Law (from Intels website). The many millions of transistors inside the CPU are made of, and connected by, ultra thin electronic tracks. By making these electronic tracks even narrower, even more transistors can be squeezed into a small slice of silicon. The width of these electronic tracks is measured in microns (or micrometers), which are millionths of a metre. For each new CPU generation, the track width is reduced, based on new technologies which the chip manufacturers keep developing. At the time of writing, CPU’s are being produced with a track width of 0.13 microns, and this will be reduced to 0.09 and 0.06 microns in the next generations. Fig. 60. 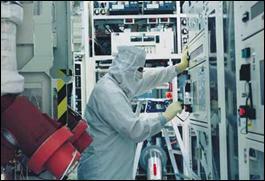 CPU’s are produced in extremely high-technology environments (“clean rooms”). Photo courtesy of AMD. In earlier generations aluminium was used for the current carrying tracks in the chips. With the change to 0.18 and 0.13-micron technology, aluminium began to be replaced with copper. Copper is cheaper, and it carries current better than aluminium. It had previously been impossible to insulate the copper tracks from the surrounding silicon, but IBM solved this problem in the late 1990’s. AMD became the first manufacturer to mass-produce CPU’s with copper tracks in their chip factory fab 30 in Dresden, Germany. A new generation of chips requires new chip factories (fabs) to produce it, and these cost billions of dollars to build. That’s why they like a few years to pass between each successive generation. The old factories have to have time to pay for themselves before new ones start to be used. Fig. 61. 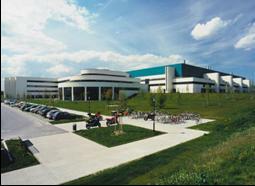 AMD’s Fab 30 in Dresden, which was the first factory to mass-produce copper-based CPU’s. We can expect a number of new CPU’s in this decade, all produced in the same way as they are now – just with smaller track widths. But there is no doubt that we are nearing the physical limits for how small the transistors produced using the existing technology can be. So intense research is underway to find new materials, and it appears that nanotransistors, produced using organic (carbon-based) semiconductors, could take over the baton from the existing process technology. Bell Labs in the USA has produced nanotransistors with widths of just one molecule. It is claimed that this process can be used to produce both CPU’s and RAM circuits up to 1000 times smaller than what we have today! One voltage level which powers the CPU core (kernel voltage). Another voltage level which powers the CPU’s I/O ports, which is typically 3.3 volts. As the track width is reduced, more transistors can be placed within the same area, and hence the voltage can be reduced. As a consequence of the narrower process technology, the kernel voltage has been reduced from 3 volts to about 1 volt in recent years. This leads to lower power consumption per transistor. But since the number of transistors increases by a corresponding amount in each new CPU generation, the end result is often that the total power consumption is unchanged. Fig. 62. A powerful fan. Modern CPU’s require something like this. It is very important to cool the processor; a CPU can easily burn 50-120 Watts. This produces a fair amount of heat in a very small area, so without the right cooling fan and motherboard design, a Gigahertz processor could quickly burn out. Modern processors contain a thermal diode which can raise the alarm if the CPU gets to hot. 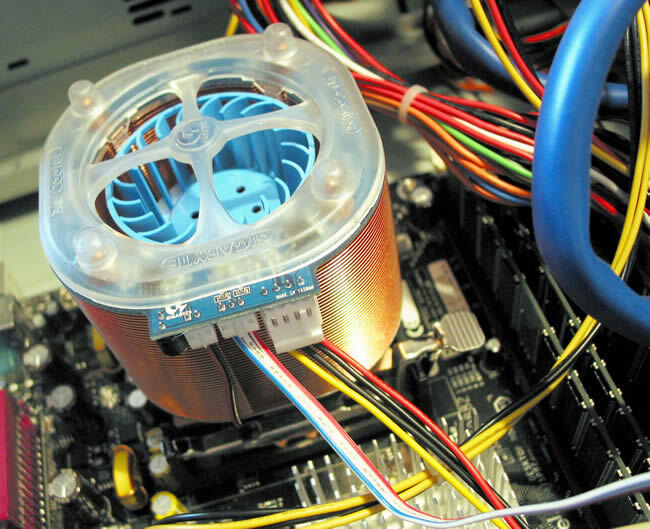 If the motherboard and BIOS are designed to pay attention to the diode’s signal, the processor can be shut down temporarily so that it can cool down. Figur 63. 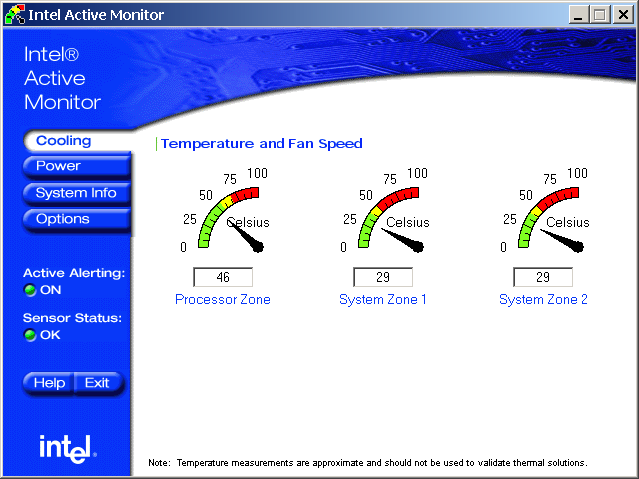 The temperatures on the motherboard are constantly reported to this program..
Cooling is a whole science in itself. Many “nerds” try to push CPU’s to work at higher clock speeds than they are designed for. This is often possible, but it requires very good cooling – and hence often huge cooling units. Higher processor speeds require more transistors and narrower electronic tracks in the silicon chip. In the overview in Fig. 64 you can see the course of developments in this area. Note that the 4004 processor was never used for PC’s. The 4004 was Intel’s first commercial product in 1971, and it laid the foundation for all their later CPU’s. It was a 4-bit processor which worked at 108 KHz (0.1 MHz), and contained 2,250 transistors. It was used in the first pocket calculators, which I can personally remember from around 1973-74 when I was at high school. No-one could have predicted that the device which replaced the slide rule, could develop, in just 30 years, into a Pentium 4 based super PC. If, for example, the development in automobile technology had been just as fast, we would today be able to drive from Copenhagen to Paris in just 2.8 seconds! Fig. 64. The high clock frequencies are the result of new process technology with smaller electronic ”tracks”. A conductor which is 0.09 microns (or 90 nanometres) thick, is 1150 times thinner than a normal human hair. These are tiny things we are talking about here. Another CPU measurement is its die size. This is the size of the actual silicon sheet containing all the transistors (the tiny area in the middle of Fig. 33 on page 15). At the chip factories, the CPU cores are produced in so-called wafers. These are round silicon sheets which typically contain 150-200 processor cores (dies). The smaller one can make each die, the more economical production can become. A big die is also normally associated with greater power consumption and hence also requires cooling with a powerful fan (e.g. see Fig. 63 on page 25 and Fig. 124 on page 50). Figur 65. 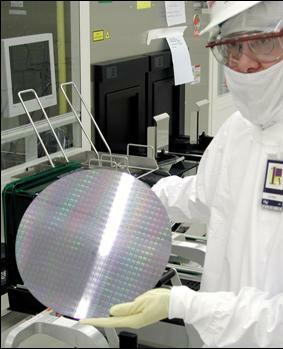 A technician from Intel holding a wafer. This slice of silicon contains hundreds of tiny processor cores, which end up as CPU’s in everyday PC’s. You can see the measurements for a number of CPU’s below. Note the difference, for example, between a Pentium and a Pentium II. The latter is much smaller, and yet still contains nearly 2½ times as many transistors. Every reduction in die size is welcome, since the smaller this is, the more processors can fit on a wafer. And that makes production cheaper. Fig. 66. The smaller the area of each processor core, the more economical chip production can be. As mentioned earlier, the various CPU’s are divided into generations (see also Fig. 56 on page 23). Fig. 67. The latest generations of CPU’s.